May 27, 2010 - PRLog -- Frank Myers Auto Maxx, an auto dealership located in Winston-Salem, NC, has been selected as the only independent dealer in North Carolina to receive the prestigious Nations Premier Independent Dealer Award. Nations Premier extensively surveys retail auto dealers throughout North America to determine fit and eligibility. These best-of-the-best dealers are located within specific trade markets in each country and must exceed top performance standards in automotive retailing, automotive service, automotive finance and customer satisfaction. Only 20 independent dealers in the entire United States are named to receive this exclusive status. The Nations Premier Independent Dealers Award Program is an initiative designed to assist consumers in both the United States and Canada. 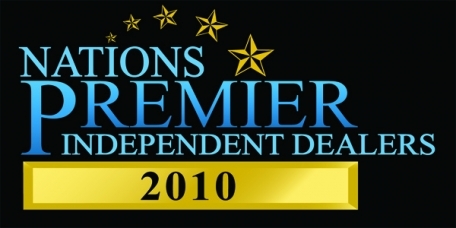 Only qualified dealers are licensed to use the recognizable Nations Premier Independent Dealer logo indicating their excellence in operational standards. For more information on Frank Myers Auto Maxx please visit http://www.frankmyersauto.com.